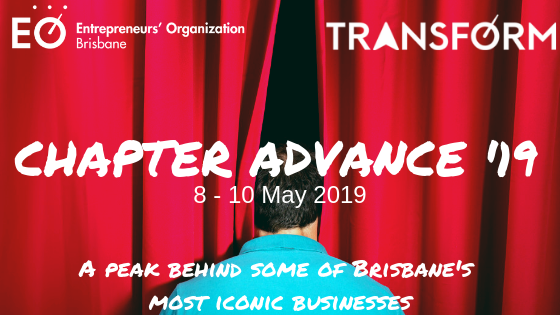 Brisbane Chapter Advance ‘19 will bring you, “Up Close and Personal” with some of Brisbane’s most iconic businesses all while you learn with a laugh. This outstanding agenda will be hosted by Corporate Communication Specialist and Stand Up Comedian, Terry Williams. EO’s purpose is to change the lives of the entrepreneurs that change the world. This year, our unique Brisbane Chapter Advance brings together your personal, business and region’s today and tomorrow - to help prepare, inspire and propel you into your tomorrow. You’ll learn how to be a more effective version of yourself, and engage with your staff and peers more effectively - through a mind-opening workshop that teaches you how to take a more constructive mindset to every part of your life. You’ll hear from inspiring entrepreneurs, who have created and run household name brands. You’ll learn how Brisbane is transforming and get an ‘EO only’ behind the scenes tours and insights of projects that will bring an extra 3,000,000 people to the River City each year… Pretty significant in a city of 2,100,000 people! There’s parts of the event that welcome employees, parts that are members only and concluding with a special spouse/partners event. Join us, tickets will go fast! Todd Howard (Owner TBH Group) is making time for a special fireside chat sharing a rare insight into the launch from being a high school teacher to becoming a successful entrepreneur. Get up close and personal with a guy who has made small ideas into income in some of the best brands you will find. Looking for raw, exclusive and inspirational?… be ready to grow. Enter the fascinating world of diamonds, jewelry making and the insights from Stuart Bishop, 2nd generation of a 3 generation, family-owned and run retail icon. You’ll meet jewellers, see the jewellery process and maybe, just maybe, something extra special ;). Matt Pollard is a globally renowned speaker who has been signed on by EO Global to benefit the network - yep he’s one of those, “WOW so glad I saw that “guy” speakers who’s schedule has been aligned with our ‘19 Chapter Advance. Matt alone will be worth your time. His book ‘The Brain-Based Boss’ takes psychological research and breaks it down, to make it interesting and useful for people wanting to improve their performance and engage the people they work with. Learn from the Port of Brisbane’s, Head of Strategy how Brisbane is designing it’s future on the world stage. Did you know Brisbane is currently the second busiest one-runway airport in the world? Check out this video to get some idea of the scale of project you’ll learn about in our exclusive EO tour and presentation. got a plan to build a 500,000kG retaining wall? Learn to improve your leadership and positive influence - amplify the performance of your team. Creating and maintaining a high-performance culture starts with the way you engage your people and help engage and align them to bring their very best performance every day. In this session you will develop your leadership skills and how to make the most of the diverse personality types in your team and to adapt your leadership style for greater impact. John Belchamber the Chief Development Officer of the OrgDev Institute will guide you (and any team or family members you bring) through a process that will increase your understanding of each other and learn how to increase your performance as individuals and as a team. The session will use the latest tools based on evidence-based research out of the USA leverage the REACH Ecosystem. The OrgDev Institute is providing every attendee with unlimited use of the entire REACH Ecosystem for 12-months. Want to step up your leadership, and improve the performance of your company? You’ll learn how, and receive the resources to keep it alive. Corporate Protection Australia Group (CPA Group) is a dynamic and specialist organisation. We provide premium emergency response and asset protection solutions supporting health & safety in the oil & gas, energy, mining, maritime, aviation and critical infrastructure industries. The CPA Group has a fundamental philosophy of consultation and communication with clients, associates and industry to maximise the outcome for our client.